In our ultimate guide to clearing up your iPhone storage and creating more space on your iPhone we detailed 13 killer hacks that will show you how to free up the available memory on your iPhone. 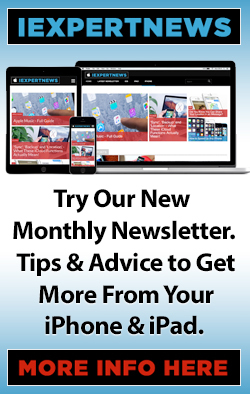 However, over the last few days, there’s been a lot of people writing about a new hack that seems to be a very quick fix to this regularly occurring problem for many iPhone users. This particular trick has been covered in quite a few places online including sites such as Lifehacker and The Independent. 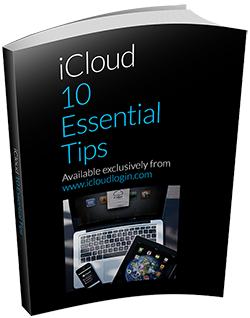 It’s quick and very easy and seems to work for most people who try it, and you can expect to free up maybe around 1GB of storage space. The process works by trying to buy and download a movie from the iTunes Store that has a bigger file size than the amount of space you have available. This seems to force your iPhone to clear out some memory. And, don’t worry, you don’t need to actually buy or rent a movie and you won’t be charged. 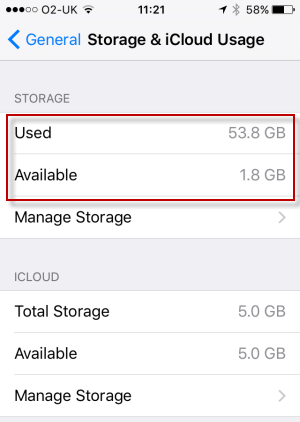 As we’ve previously covered in our ‘iPhone Storage full?’ post, all efforts to free up space on your iPhone begin with checking how much storage space you are using and how much you have free. Click through and then under the heading ‘Storage’, select ‘Manage Storage’ at the top you’ll see headline figures for the amount of storage you have ‘Used’ and ‘Available’. You can also find this figure by going to Settings > General > About and scrolling down to ‘Available’. When you know how much storage you have available, head over to the iTunes store and look to rent a film that is a bigger file size then you have remaining available on your iPhone. 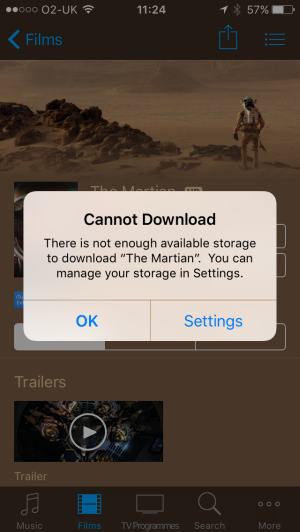 In my case, I had 1.8 GB of storage available and when I went to the iTunes Store I thought I would check the file size of ‘The Martian’. 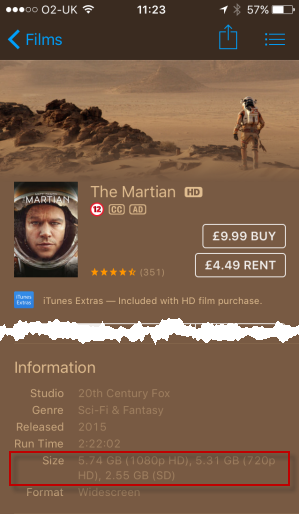 To see the file size of the movie that you’re looking to rent, scroll down the listing on the iTunes Store until you get to the section called ‘Information’. In there I could see that ‘The Martian’ movie would take up 5.31GB. Obviously, therefore, a lot more than I had available. So, the next step is to click ‘Rent’ to try to rent the movie from the iTunes Store. As I said at the start, don’t worry about being charged. As long as the file size of the movie is more than the available storage you have on your iPhone, it isn’t going to allow the attempted purchase to go through and you cannot be charged. At this stage you can click either ‘OK’ or ‘Settings’, which will obviously take you to the main Settings screen and you can click through further to see if anything has happened to your available storage. But, you don’t in fact have to do anything else. The beauty of this trick, if it works for you, is that it will have automatically begun to free up some storage space without you doing anything else. For some people it seems to take a minute or two before the process takes effect, but some people will see an immediate increase in the amount of storage available. As I said, I had 1.8GB available before I tried to rent ‘The Martian’ and after my first attempt this increased just a little to 1.9GB. However, as suggested in many of the recent articles, it seems to be worth trying this trick more than once. I therefore tried a couple more times and ended up with 2.2GB free. 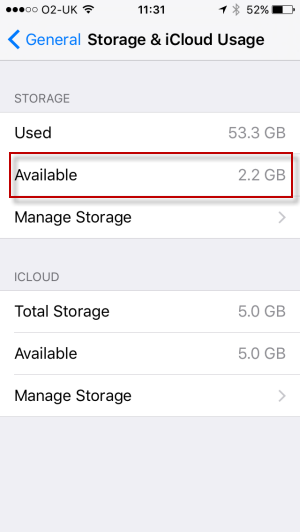 So, for me the increase in available storage was only 400MB (0.4GB), but I had thoroughly cleaned out the storage on my iPhone and optimised it after reading our recent article [LINK – https://www.icloudlogin.com/iphone-storage-full] so I don’t think there was much improvement for the iPhone to make automatically. Although many of the articles about this trick have been saying that it is not completely clear where this increase is coming from, it seems to me that by attempting to download a file which is bigger than the available space, this prompts your iPhone to clear its cached memory, which otherwise does take up some of the available storage. This clearing of the cache is something which is happening all the time on your iPhone as a background process in which you need not take any involvement and which happens when your phone is running low on space. 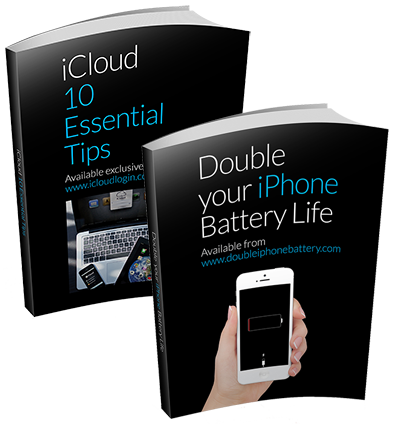 However, trying to download a file which is bigger in size than the available space on your device seems to force the iPhone to speed up and attempt the best clean out of memory that it can and therefore frees up a substantial amount of space in one go. And, that’s it. That’s all there is to it. Just give this tip a go and you will probably see an increase in your available storage. As a small aside, in doing this I discovered something about the iTunes Store and movie files that I hadn’t previously been aware of and I ended up reading this article on CNET which has some great advice on saving a few bucks on film rentals or purchases from the iTunes Store. It’s all to do with whether it’s worth downloading films in HD or SD (which just means ‘standard definition’) the article comes down firmly on the side of it being not worthwhile spending the extra for high definition, which is all down to the way the screens on your phone and iPad display movies. So, although that isn’t what this article is about, it is an interesting piece of information to know should you be somebody who regularly purchases and download movies. I’d be really interested to know if this storage trick works for you since it doesn’t seem to work for absolutely everybody and that seems to be dependent on how well managed their storage on their iPhone is at the time at which they attempt this trick. Do leave me a comment below with your experiences.